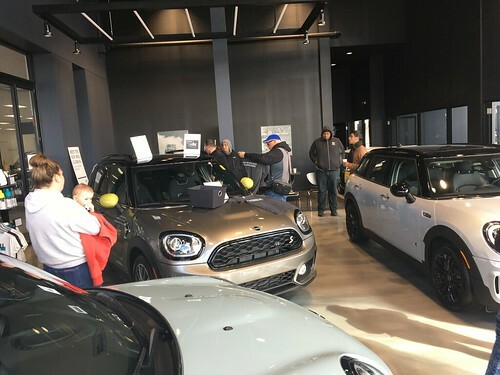 WRAPUP: The Chicago MINI Motoring Club took a 6th place against some tough competition. The 300 lap full track format, warm weather, and manditory driver changes and fuel strategy made for a marathon event. Highlights/Lowlights included 3rd overall top lap time by Adam, and a not so nice pass attempt by another team that sent Marco into the wall hard enough to damage his cart and knock the wind out of him. Overall, it was a great evening of racing and a very fun time. We also had the best looking cars lined up out in the parking lot (possibly with the exception of the Shelby Cobra and Daytona replicas). Also an extra special thanks to Blake, Anthony, Rob and Michelle coming out and cheering everyone on!!! We have been sent information about a Car Club Challenge at Chicago Indoor Racing..
Do we have 3-6 club members interested in participating? Racing starts with a 20 minute Timed Qualifying Session to allow all of your drivers to warm up for the race and to qualify for the Team’s place on the starting grid. At the end of the timed practice session, karts will be arranged in qualifying order and the last driver to qualify will start the race. During the 300 laps of racing teams made up of 3-6 drivers will be required to make 5 driver changes and even a fuel stop! for 300 bucks id rather do a track day. But its interesting nonetheless. I wish i had the money, lol. It’s $300 per team… if we can get 6 people, it’s $50 a head… Anyone else interested??? $50 is not bad at all. I would do it for $50 each. Now we need 5 more. We do need to make this happen VERY fast to get the paperwork done. if its 50 bucks then im in. Im sure adam would be in too. i reeally should read things more in depth, lol. Just wanted to put a quick shout out to club member Rob for giving us the heads up on this event and to Brian from CIR to whom I spoke to and received the registration info. A Ringer never hurts. Also note, that we can have up to 3 teams. Teams are 3-6 members each. We will also need a fan club ALL are welcome to cheer on Team CMMC. Sounds like fun, but unfortunately can’t make it, gonna be in Wisco drinking copius amount of beer. You should recruit Gabe and Ken. If I recall they had really good lap times at the last event. You should recruit Gabe and Ken. So far, it is looking like Dustin, Marco, Adam, Paul.. Since I’m not going to Putnam or Mid-Ohio that weekend I can do this! If you are looking for an old slow guy with $50 in his pocket, I’m your man!! Thats Good News, now I wont be the oldest guy on the team. I know you want to go fast too. We have our 1st Team, there is time and room for up to TWO more teams. I’m here at CIR with a 4pm run time. Anyone want to play? Great racing all!!! Marco, hope you feel OK.
Im feeling much better today, last night i had felt like id been hit by a bus and i went to bed early. Thanks to everyone who helped me out yesterday and i promise to come back with a vengeance next year. Glad to hear you are feeling better! I was wiped out when I got home and hit the sack early too. Paul, the spot on my leg is the inside of my right knee. It’s red and tender from hitting the steering column I think it is. I never notice when I’m there, it’s the next day. How’s “iron man” Adam feeling? It was fun we will have to do it again. Oh i am great jim, not even sore. They dont call me the “iron man” for nothing. lol And yes we should definitally do it again. I had a blast, and would do it again although I’m sure you can find faster guys than me to help with the team score.. I had a great time, only wish I had NOT done laps on Friday, it did not help me help the team Sunday. I think next year we could have two teams. Team Comp and Team Fun. It is a good value for Team Fun with 6-8 drivers, less then a buck a lap and take short runs to really enjoy the track time. Team Comp, would be full of skill and youth or just skill. LOL. I too went to bed right away and look forward to seeing pics soon. Hey Marco, do you have a steering wheel mark on your chest? No but wouldnt that be a cool thing to show the ladies, lol. Haven’t had a whole lot of time this week but I’ll try to have some photos up by the weekend!